Guess How Much I Love You – Interactive Episodes is FREE for a limited time. 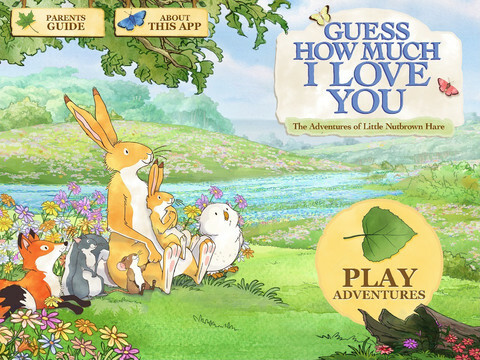 This wonderful educational app from Australia is based on the book Guess How Much I Love You by Sam McBratney and inspired by the animated TV series created by SLR Productions Pty Ltd. Guess How Much I Love You is a beautiful story about the love between a parent and a child – one of my all time favorites. Originally published in the UK in 1994, it has sold more than 20 million copies in 37 languages. It was the first book I purchased for my granddaughter – truly a book not to be missed!! That being said, this app conveys the same sweetness that makes the original story so special. Kids join Little Nutbrown Hare in 2 interactive episodes – “Can You Touch the Stars” and “Snow White Hare.” Designed for 3 – 5 year children to explore with their parents, the episodes are integrated with simple games & puzzles. At the end of each episode, Big NutBrown Hare and Little NutBrown Hare express their love for each other. Don’t miss this one – it is SO sweet!